People from Southampton call Portsmouth folk ‘skates’ and you can find out why this weekend – or maybe you can’t. 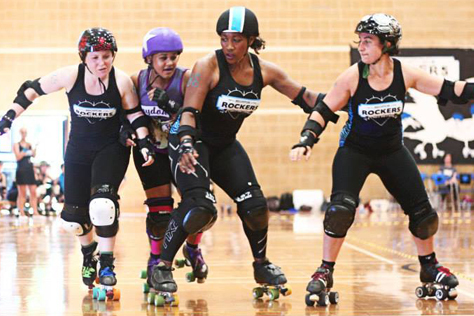 Either way, the mighty Brighton Rockers are back in action on Saturday (25th October) as they take on Portsmouth Roller Wenches, statistically one of the most evenly matched opponents they have ever faced. Although the match is in Havant, it’s Brighton’s nearest open door away game ever, just an hour’s travel by road or rail. We thoroughly recommend that all Rockers fans, even those who normally only attend home games, get along for this one. Brighton’s planned home game in November has been cancelled, so this is the closest to home they’ll be playing for quite a while. Also, not only does it mark nearly a year (just one day shy) since the A-team last played away from Haywards Heath, it’s also the final appearance for a while for a few top Rockers who are taking extended breaks from derby. So get yourself down there to cheer them on. Doors are at 1.30pm and the Wenches v Rockers game is first up at 2pm, followed by a second match in which Portsmouth’s B-team take on Essex girls Killa Hurtz. Tickets are £7 in advance (£8 on the door) from the link at the bottom of this piece. Havant Leisure Centre is located in Havant – there’s a shock. It’s around 45 miles from Brighton, so if you’re driving point your car left/West for just over an hour and you’ll find lots of parking at the venue. For us car-dodgers it’s less than five minutes walk from the train station (use the north exit, rather than the main one) and trains from Brighton take 61 minutes, seven quicker than driving, with no changes and no engineering works, yay! With a railcard a day return to Havant is £8.50, and there are around a dozen pubs (including a Wetherspoons) just south of the station, should early arrivers feel thirsty – although none rate all that well on Beer In The Evening. The after party is taking place at The Honest Politician, a loud studenty pub with cheap drinks deals on the main nightlife drag of Elm Grove, Southsea. This is three or four stops further away on the train (15 mins walk from Portsmouth & Southsea or Fratton) and it may be worth buying a return to P&S instead of Havant to begin with, then hoping that the ticket gates are open when you arrive for the game. Otherwise an add-on ticket’s about £3 return. For connoisseurs of real ale and beards who fancy pre- or post-after party drinks, the Hole In The Wall (Great Southsea Street) is 3-4 mins walk further up Elm Grove; it’s probably the best ale pub in Hampshire. Portsmouth currently place 14th in UKRDA on 614.1 points, a little way behind the 10th placed Rockers (640.8). The predictometer at flattrackstats.com gives Brighton 64% probability of taking the win, with an expected points differential of 41:35. This would equate to something like a 184-157 away win. Pretty darned close! The Euro rankings differ only fractionally, still giving Brighton (26th, 638.9 points) a 64% win chance over the Wenches (41st, 612.7) but with a marginally narrower 7:6 differential, equivalent to a not much different 183-157. The day’s second game sees Portsmouth’s B-team, ranked 177th in Europe on 515.0 points, given an 87% win probability against the Killa Hurtz who rank 283rd (473.6). Predicted score differential of 27:16 here equates to something like 216-128 on the board. Hi there. Most Brighton fans are aware of neighbours the Wenches, but for any who aren’t, can you tell us a little about PRW’s history and achievements to date? PRW began in June 2010 and it took us a while to get bouting due to trouble finding venues. But since our first game the team has gone from strength to strength, climbing up the rankings and beating some tough teams such as Kent and Bristol. We have highly skilled skaters, including some who progressed to a high level in Team England tryouts and some who are sponsored. We have a great team spirit and PRW are proud of what it means to be a Wench! You defeated Brighton’s B-team Bruisers 246-191 back in March 2013. Has your squad changed much since that game? Any particular Portsmouth players or tactics the crowd should keep an eye out for? There have been a few changes since that game, but we have been going from strength to strength throughout all of these changes. In terms of players, watch out for all of them as they all have their own talents that we are proud of. In terms of tactics there are lots the crowd should look out for, but we might get it trouble if we tell you. What do you know of the Brighton A-team? Any particular Rockers players or tactics you’ll be watching out for? Care to predict the result? As a team we’ve seen a lot of their bouts and we know that they are very strong, so we need to look out for them trying to power through. We won’t try to predict the score, as both teams work and play hard, but either way it’s going to be one heck of a game to watch! The day’s other game sees your B-team up against Killa Hurtz from Chelmsford. The Essex side are fairly new to bouting, so presumably a bit of an unknown quantity? We certainly don’t know as much about Killa Hurtz as we do about Brighton, but our Bs have a lot going for them and will be giving it their all, adapting their tactics to take home the win. For those travelling across for the games, can you tell us a little about your venue. Finally, what can people expect from the after party? And do you have any tips for other things to see and do in the Portsmouth area? If there’s one thing that always happens at a Wench after party, it’s the Wench pyramid. We can’t help it and we’re always trying to get more and more people in it. We love it when the other team(s) get involved and try it too. As for Portsmouth, it depends on what you’re in to. We have a beach and fairground, some amazing places to eat, several places to go for a shop, and lots of museums and warships for those who are interested in our history. Hi there. Your last game (home to Bristol) saw the Rockers take the win by 68 points. Did that match go the way you thought it would? Anything from it you’re using in preparation for Portsmouth? EMMA THE CONDEMNER: In May 2013 when we were up against Bristol in the midst of a tough tournament, it’s fair to say we underestimated them, got cocky and lost. However much we all know that a lot can change in a year, and however hard you train, I for one was s**t scared about facing them again. So yes, I was definitely very pleased to win this time round. They were tough to beat, but we managed to keep our calm and hold our game, and these are both things that we will be taking with us to Portsmouth. I don’t want to give too much away, but we have been working hard on skills taken from the Gotham bootcamp and building on things that worked against Bristol. The game in Havant will be the A-team’s first away match in almost a year. In the intervening time you’ve played six home games. How does home and away preparation differ and is this your shortest away trip ever? MISTRESS VON ÜBER VIXEN: As the current Rockers’ bout co-ordinator, it has been a very busy season! We’re looking forward to a few more away games in the future. Portsmouth is indeed the shortest travel distance we’ve gone for an open game and that makes training for this match easier than most. We can focus on our gameplay exclusively, without the added pressure of putting on a home event. All league members contribute to hosting bouts, so away games leave us with more time to strengthen our tactics and line-ups. 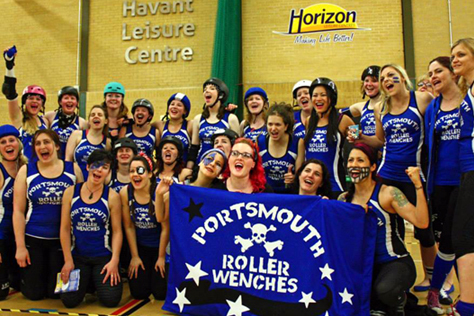 Brighton’s B-team Bruisers played Portsmouth in March last year. The Wenches took the win 246-191. Did any of the current All-Stars roster play in that game? What do you know of the Wenches in general? THE MIGHTY MIGHTY BASH: Hyde ‘N’ Shriek, Enyo Face, Kapow, Emma and Cake Or Death were all on the roster when Brighton met Portsmouth last. As regards the Wenches in general, to be honest I’ve been a bit out of the derby loop of late. I have not seen Portsmouth play for quite some time. I coached them a while back but I’m sure they are a different team now. I’ve heard they’ve come up in rankings quite a lot recently. Brighton Rockers and Portsmouth Roller Wenches have a pretty good relationship, so I reckon both teams know what individual skaters to look out for. However, the outcome of the game I’m sure will come down to the team that works well together and keeps things solid on the day. 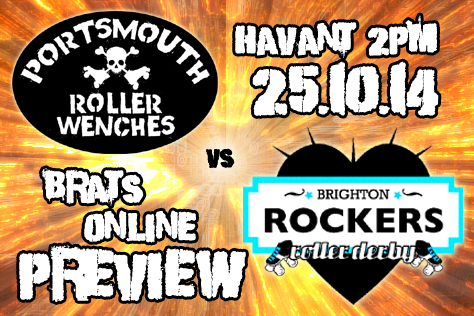 Moving on to Brighton, are there any players or tactics we should look out for from the Rockers at this game? Would you care to predict the result? BASH: Tactics-wise, I’d say just always be on the look out for ‘the raw prawn’. Keep an eye out on Enyo Face and Emma the Condemner. Both have really upped their game in the last few weeks. I don’t have a prediction for you, but I have a feeling it may be close either way. The day’s other game sees Portsmouth’s B-team up against Killa Hurtz from Chelmsford. Have you any predictions for how that one might go? MISTRESS: Unfortunately, none of us know anything about Killa Hurtz, so it will be interesting to see what this team has to offer. I do know that they’ve had two recent strong transfers from the Seaside Sirens, although as far as we’re aware only one will be playing in this particular game. Finally, we understand there may be a few changes to Brighton’s squad after this game, with some big name players taking time out and at least one incoming transfer. Is it easy to adapt to such personnel changes? What can we expect from the Rockers going into 2015? RACEY: Yes, we have a bit of a roster change-up on the horizon. A few of our key travel team players are taking temporary leave to do much more exciting things, which is sad, but also really exciting as it means there will be spots up for grabs for all our skaters who are not yet rostered. Hopefully there will be some fight-to-the-death action for those spots. Obviously this is going to mean some changes for the team, particularly for line-ups and play style, though also for the games we will be looking to book for 2015. It’s going to be really exciting for both us and the fans to see how the new look team will develop. We have some great up-and-coming players in our midst so I’m totally confident that they will be holding their own on the track. Watch out! This entry was tagged Brighton Rockers, Havant, Killa Hurtz Roller Girls, Portsmouth Roller Wenches, roller derby, rollerskating, sport, UKRDA, women's sport.